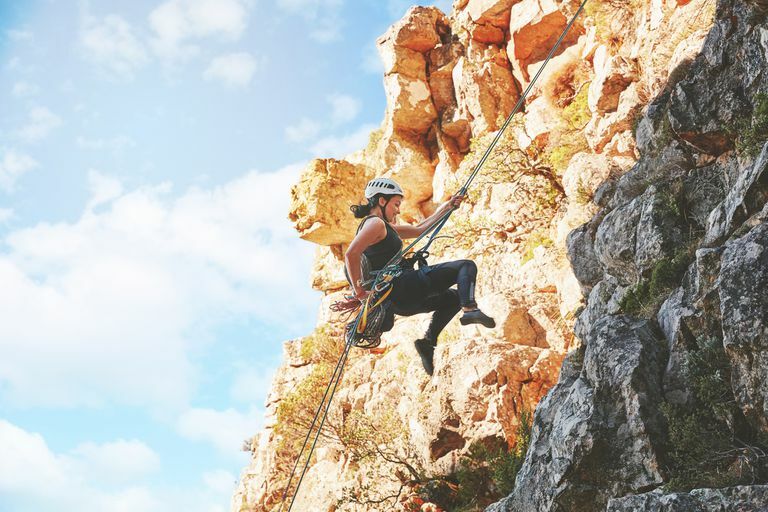 Rappelling, the act of making a controlled slide down a rope or ropes while using a rappel device to brake and control your descent, is not one of the most dangerous climbing activities. Lots of big and small things can go wrong when you rappel. One of the most common rappelling problems is encountered when pulling or retrieving the ropes. Unless you are extremely careful and conditions are ideal, it is easy to get your rope stuck either before you pull it or while you are pulling it. You just finished a big eight-pitch climb at Red Rocks outside Las Vegas and now your climbing partner and yourself are ready to rappel back down the route. You have tied the two climbing ropes together using a strong double figure-eight fisherman’s knot. You stack the two ropes separately and then throw them down separately so they do not tangle into a messy ball of rope linguine 100 feet down the cliff. Now, before either of you starts the rappel, you should both look at the rappel rigging and set-up. Do a safety check by double-checking the knot between the two ropes to see if it is tied properly and that the tails of the rope are secured. Check if the rope goes through a metal descending ring and that the chains or slings that secure the ring to the anchor bolts are in good shape. If they are not, then add an additional piece of webbing or sling as a backup. Which Rope Do You Pull? Look at which side of the descending ring that the knot is on. That’s the side to pull. Look at the color of the climbing rope. Do you pull orange or blue? Agree which one you will pull before rappelling so you don’t pull the wrong rope and jam the knot in the ring. It seems like a dumb thing but believe me, the wrong rope gets pulled all the time and can end up being stuck and creating a full-blown epic. Are the Ropes Crossed or Tangled? Are the ropes crossed over each other or are they twisted on the chains or slings? Make sure that both strands of rope run cleanly down the wall from the rappel anchor without twists or binding against each other. It only takes one twist against the anchor or ring to hang up your rope and make it impossible to pull. Also remember that as you rappel, the ropes sometimes twist against each other. Make sure the last man down separates the ropes so they drop without tangles and kinks to the next set of rappel anchors. The best way to do this is to get in the habit of putting a finger of your guide hand above the rappel device between the two ropes as you descend. This simple act keeps the ropes separate from you to the anchor above and keeps the ropes from twisting impossibly around themselves. If those ropes are twisted up at the anchor, you probably won’t be able to pull the ropes down and you’ll have to reascend the stuck rope to untwist them—not fun! Are there any rock features that the ropes can hang up on while they lay statically against the rock or when you are pulling them? Look for notches, flakes, grooves, sharp edges, and loose rocks, especially in the first 10 or 15 feet of the rappel. Position the rope if possible to avoid these features which could possibly hang up the rope. Also, as you rappel downward, look for trees, bushes, flakes, and rock blocks that the rope could hang up on when you pull it from below or if the rope could possibly dislodge any loose rocks that could hit you. Pay attention and again, try to position the rope safely. Everyone who rappels much has a horror story of loose rock that the rope knocks off as well as an epic story about the rope getting snagged in a tree above. After the first climber rappels down to the next rappel station, have him test the pull of the ropes. If it pulls easily, you will be fine. If it is a difficult pull, look for adjustments to the system at the top before you rappel down. The usual solution is to move the bulky knot that ties the two rappel ropes together further down the cliff. If you are standing on a ledge, the knot will often hang up on the edge of the ledge. Move the knot down below the ledge and have your buddy try to pull again. That usually solves the problem. Then pull up the ropes, attach your rappel device to the ropes, and then carefully climb down over the ledge before weighting the ropes. When you pull the ropes on multiple rappels, feed the free end of the rope through the new descending ring as you pull it. This saves lots of extra rope work and keeps you from losing the rope if you just let it fall to you before threading the ring. As you pull the ropes, pay attention for falling rocks that the ropes could dislodge. Wear a helmet and keep your head down so a flying chunk doesn’t hit your face. Remember that the flying free end of the rope after it has pulled through the rappel anchor can act as a whip, lashing your face or arms. And it hurts too. Lastly, remember to yell “Rope!” when you pull the ropes down so anyone nearby is warned of both falling ropes and falling rocks.